En plein air is a French expression meaning “in the open air”, and refers to the act of painting outdoors with the artist’s subject in full view. 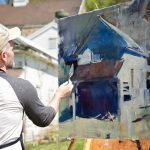 Plein air artists capture the spirit and essence of a landscape or subject by incorporating natural light, color and movement into their works. The high point of plein air art came with the emergence of Impressionism in the mid-to-late nineteenth century. Artists of that period who painted outdoor landscapes included Monet, Renoir, Pissarro, Cezanne and Van Gogh. Interest in outdoor painting has remained constant since the twentieth century. Today’s artists carry on the traditions of these past masters by capturing light and movement in landscapes that can only come from seeing the subject outdoors in its natural form. 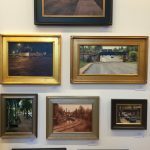 The last twenty years have seen a resurgence of interest in plein air painting in the United States. 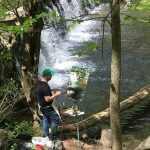 During this time, groups of plein air painters began gathering together to paint at single locations or within certain geographic boundaries. These “Paint Outs” are now very popular and give artists a chance to share their talents and creativity with the public and with one another.